The award-winning developer of networking, broadband, digital electronics, voice, data and video communications, D-Link has unveiled its new stylish and compact 7-inch USB-powered LCD monitor (800 x 480 resolution with both landscape and portrait modes) designed for multi-tasking PC users. 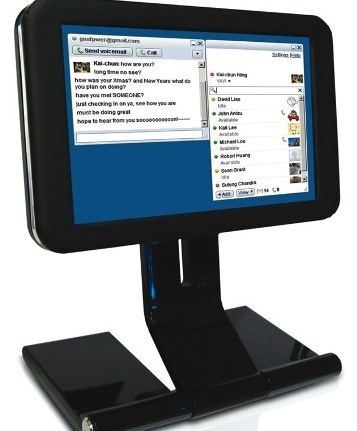 Dubbed as D-Link SideStage, it’s intended to be a secondary monitor to display instant messaging, watch videos, conduct video conferencing via webcams, display Yahoo Widgets and Microsoft Gadgets as well as house common tools from programs such as Adobe PhotoShop. The new D-Link SideStage 7-inch USB-powered LCD monitor that measures 7 x 4.6 x 0.75-inches and weights just 1.34 pounds is expected to be available later this year but the pricing has yet to be announced.